“For irrigation purposes, especially for fresh vegetable cash crop production in water deficit areas, water is collected in ponds from springs or small streams. The ponds are lined and sealed with sheet membranes (200 g/m2 fibre-reinforced plastic sheets, Silpaulin). The sheets are water proof; less affected by earth-movements, affordable for small farmers and can be easily repaired in case of small tears. However the sheets are photosensitive and tend to become brittle when directly exposed to the sun, especially when ponds are empty or filled with less water. A big thank you to Abe for recommending this process. Reader contributions are much appreciation. Vast areas of the world lack sufficient year-round water supplies so ideas such as this one are very important. 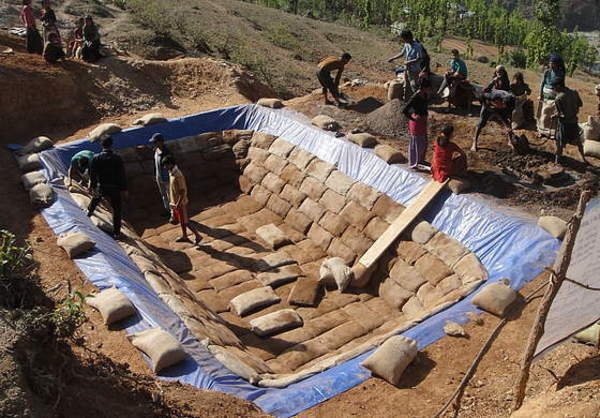 This story also goes to show how earthbags have many uses. Compare to the earthbag water tanks in the South Pacific islands of Vanuatu. I love this idea. I wanted to install a pond on my property and this way looks much more affordable and manageable than the other options I was exploring. Depending on the size, manual labor can also be used to complete the process. In Ghana, aside from the labor, the cement, dirt and bags would cost less than US$175. That’s a LOT of water for $175. It’s enough to water a big garden and orchard and pets. In some countries there are government farm subsidies and/or coops to defray the cost of farm ponds. Sometimes there is a village or district coop that work together to pay part of the excavation. The excavator gets their gas and labor covered and they in turn can sell the excavated soil to raise building sites. Fly over Thailand for instance and you’ll thousands of ponds like this everywhere, so there are probably millions in the whole country. 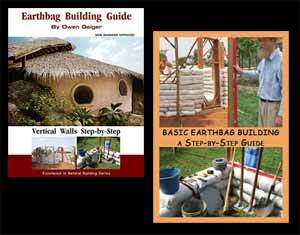 Earthbags have dozens of uses as we’ve thoroughly documented here on our blog. Sooner or later one or more of these ideas will really catch on and go viral. In a country like India, for example, there are countless thousands of these ponds. Do a google image search and you’ll see most of India has drought conditions and so farmers must save up water during the rainy season to get by.